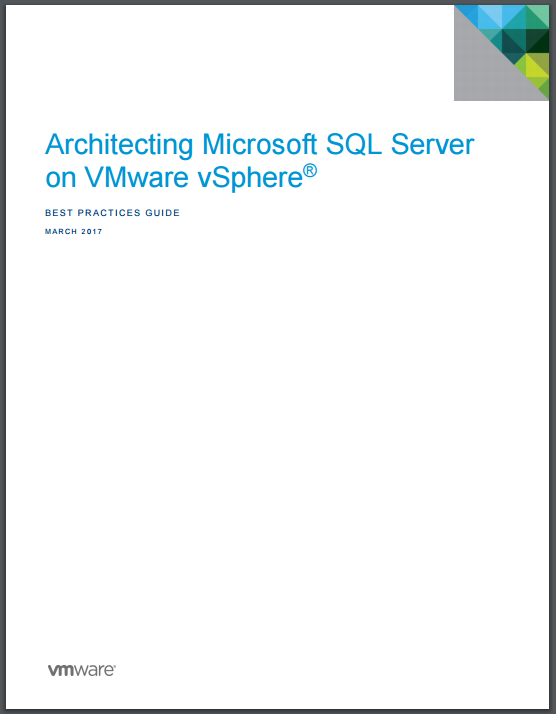 Heraflux is proud to announce that w e contributed to the latest revision of the Microsoft SQL Server on VMware best practices guide, freely available at this address. This document outlines some of the common VM-level tweaks and adjustments that are made when running enterprise SQL Server VMs on VMware platforms. This guide is considered a must-read if you manage these sorts of SQL Servers, which cannot be treated as general purpose virtual machines. This guide was recently updated for vSphere 6.5, and we consider it an absolute must for your enterprise management library! Special thanks go to Niran Even-chen for his efforts in making this guide continuously current, plus Allan Hirt and Deji Akomolafe for their contributions as well. We hope you all can join David Klee for an upcoming webinar as part of the Datacenter Madness webinar series, presented by ActualTech Media, Nutanix, and Intel. The Madness is moving from the basketball court to the cloud. It’s time for the ultimate data center showdown where opponents will go head-to-head debating the hottest methods IT pros are relying on to eliminate IT complexity and build the Enterprise Cloud of the future. He is dueling in Round #2 on March 28th at 2pm Eastern to discuss traditional RDBMS versus NoSQL databases and separate virtualization stacks versus integrated hypervisors. It’s sure to be a blast!